You are currently browsing the tag archive for the ‘Hello-Kitty’ tag. I was changing my wallet today; I wanted to reuse one of my old wallets. As I was pulling out my old wallet, it felt a bit thick for being “empty”. To my surprise I found a stack of cards stashed away inside (eg. various business cards & store point punch cards). This was the biggest surprise of all! Many great memories came flooding back as I was sorting through these punch cards. Ever since I was a small child up until my early twenties, I used to shop at my local Sanrio™ shop probably once or twice a month or so. (It got worse when I was able to drive a car.) Each time you made a purchase of a certain dollar amount or more, you would get your point card stamped. 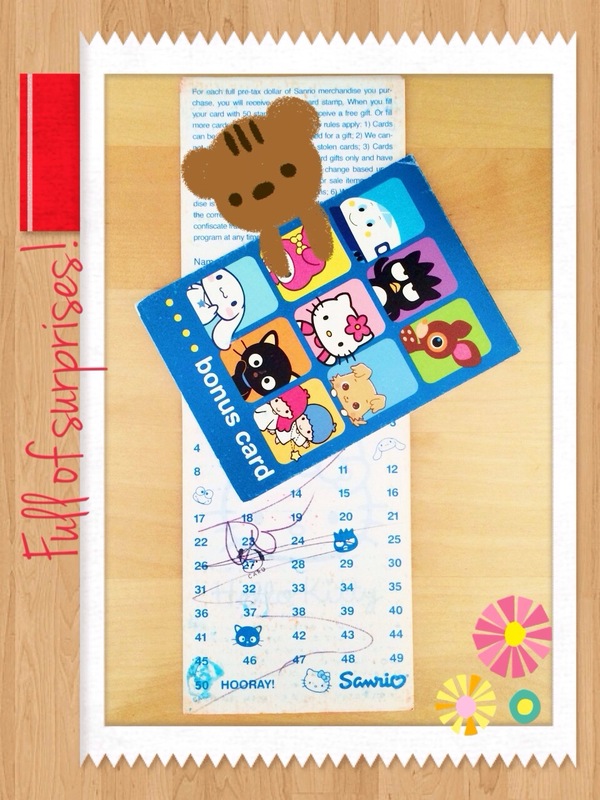 Then, when you filled up your card(s), you were able to redeem them for prizes. The more point cards you accumulated, the bigger (for lack of a better word) the prize you could get. I would save all of my cards each time to get the highest point value prize. I was probably saving these cards for something special I wanted…which is of no use now, since Sanrio™ has discontinued their point card program for quite a few years already. Not only do these point cards bring up memories of the times I used to regularly shop at this store, but it also triggers memories of the wonderful times spent working there as well. Yes, I used to work at my local Sanrio™ shop. One of the greatest memories I have of that shop was the day I was invited to work there. The shop manager kept noticing me every time I shopped there. So, one day she approached me & told me that I should just work there since I would visit often enough, & I would get a sweet employee discount. That sealed the deal for me. I ended up working there for approximately four years, made lots of fun friends, learned how to appreciate everybody working in the retail industry right down to the “little guys” behind the cash register & taking out the trash. I had so much fun working at that place. I even got a big compliment from our regional manager for having an overly-obsessive knowledge of all things Hello Kitty & Sanrio. Those times have long since come & gone. The shop I once worked at has changed ownership & management, moved to a new location, & now looks completely unrecognizeable. A new shop has taken up our old location within the shopping mall. However, the memories still remain each time I walk past that storefront. Those surely were the good ol’ days. Cheers. What a delight, a real super surprise! I just couldn’t believe my very own eyes…I had found it tucked away in the deep dark corner of my dad’s makeshift (a.k.a. DIY) tool shed. Has it been there the whole time? I had given up hope years ago…long thinking that my mom had given it to one of her friend’s children (which she had done to so many of my childhood belongings…even while I was still a child playing with them.) I really had tucked these memories away to the far reaches in the back of my mind. THEN THERE IT WAS, STARING ME RIGHT IN THE FACE, CRYING OUT TO ME. It had most definitely seen brighter days. It was severely beaten, chewed up, spat out, ravaged by lack of any care or attention. What is this thing I am talking about, you ask? 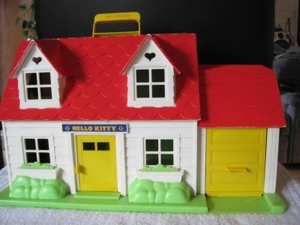 Why, it is the SANRIO HELLO KITTY 1984 CHILD GUIDANCE DOLLHOUSE PLAYSET. 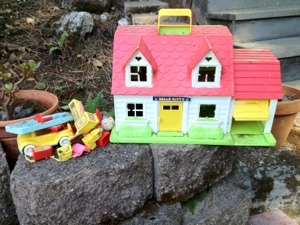 This toy was my most favorite thing to play with when I was growing up…it didn’t matter how old I was. I treasured it with all my heart & then some, until I had outgrown my toys & asked my parents to put it away for safe-keeping. Little did I know that it was to be chucked to the back of my dad’s flimsy tool shed, only to be ransacked & torn apart by a family of rats…who chewed up the plastic windows, burrowed inside, shat EVERYWHERE, couldn’t find their way out & eventually died. Oh look! A new figurine for my dollhouse. Nope. That’s just a dead rat skeleton. Wait. There’s two of them, plus the fetus of the baby rat. Lovely. 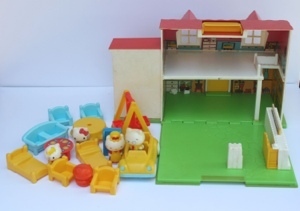 Since I have no way of salvaging my dollhouse, I have been frantically searching on the internet for another one (even a “previously loved” one will do, as long as it has all the matching playset pieces & figures). To my dismay, I have been unsuccessful in my search…which kind of bums me out. I was really hoping I could regain a piece of nostalgia from my childhood & perhaps pass this toy on to my 3-year old niece or even my future child.